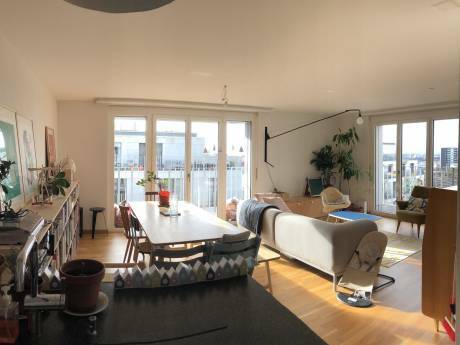 We have a comfortable family friendly duplex apartment in a small suburban town, Chavannes/ près Renens, which is situated next to the Olympic capital Lausanne. Our flat is part of a modern apartment complex with alltogether 5 floors and 6 independant apartment buildings. We think our flat is very cosy and comfortable and at the same time offers most modern conveniences such as floor heating, dishwasher, washing maschine, DVD, Stereo, internet, etc. The place is light and spacious; we have a big balcony on the first floor and access to a large terrace with a small private garden in front of it. From here we have also access to the communal garden which offers many space for children to play (there are three public playgrounds at their disposition). On hot summer days we spend many evenings on the terrace where we have a barbecue and a shaded dining area too. 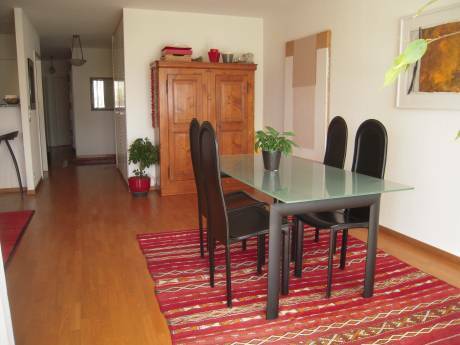 The whole apartment complex, inclusive garden and play facilities, is very well maintained and looked after. From our terrace we can see the Alpes. There are four bedrooms on the first floor although one we do use predominantly as office (with two working spaces, computers, printer, fax etc.) Two of the remaining bedrooms have a double bed each and the other room has a single bed. On the groundfloor you will find our living room and an open kitchen. We are a multicultural family with Zoubaier from Tunisia and Bettina from Germany and our two girls Nelly (14) and Nora (4) who have mainly been socialized in Switzerland. Zoubaier is engineer and freelancer and Bettina works as research assistant with the EPFL and is currently doing her PhD. We love to meet and entertain people and we do often have friends and family members staying with us. We enjoy travelling very much and we try to find destinations where we can combine the very different interests of all family members with each other: Culture, nature, swimming and beaches etc. Recently our family was extended by a small guinea pig, which can also stay with friends in case you do mind pets. We live in a small surburban place next to the University of Lausanne and to the famous Swiss Federal Institute of Technology (EPFL). The area is calm and very green. It is a very safe place as most places in Switzerland. In terms of infrastructure we are very well connected to Lausanne (10 min. by tram) and other places. 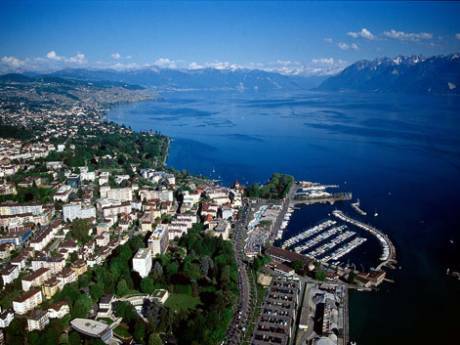 The Lake Geneva Region as such is extremely beautiful and a kind of miniature version of Switzerland. We have a micro climate that allows even palm trees to grow. The city of Lausanne and its environnents lay in between the Lake Geneva, the wooded hills of the Jura, vinyards and a the snowy summits of the Alps. Alltogether this region offers a vast choice of sporting, cultural and leisure activities in summer as in winter. The Geneva International Airport is about 35 minutes by car and we are also very quickly connected to other places in Europe such as Paris (3hrs by TGV direct); Italy 1.5hrs, etc.